It takes a great deal of compassion and dedication to continue in the line of social work despite minimal acknowledgement. Positive People and Human Touch, two NGOs that work with HIV afflicted persons, have collaborated in the past and most recently to organise a camp for HIV+ children and children who are affected by it, from the ages of ten to twenty. The summer edition of these camps, called Sunburst, is the third of its kind to empower these youngsters. 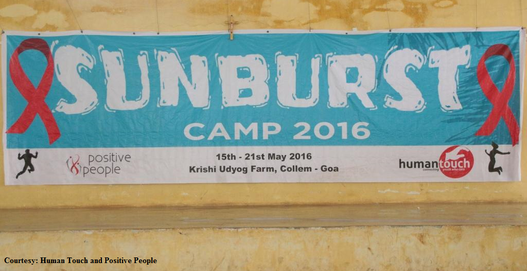 The camp was held from the 15-21 of May at the Krishi Udyog Farm, Collem, Goa. The six-day residential camp was a means to bring together these children who have the virus themselves, or have parents or siblings afflicted by it. New antiretroviral medication has helped keep AIDS and other incapacitating effects of HIV at bay, and allows these children to live relatively normal lives. However life throws a different set of challenges for these young people to negotiate. Although they are unable to evaluate the gravity of their circumstances, as they enter adolescence things become clearer to them. ‘It all depends on how they come to know about it. If they are told in a harsh manner, they find it difficult to deal with it,’ says Peter Borges, CEO of Human Touch and secretary of Positive People. These camps are a perfect environment for these children to build friendships, discover themselves and set goals they can pursue to add meaning to their lives. To that effect the Sunburst camp had a plethora of activities, lectures and sessions with resource persons imparting life skills. Apart from sessions to develop analytical and problem solving skills by the volunteers, there was mandala art therapy by Vaishali Lall, a graduate in Fine Arts and a life skill session on communication by Vividh Pawaskar. Vaishali Lall, who has been using mandala art therapy to allow people to reach their inner conflicts and resolve them, says, ‘The mandala is very powerful and a sacred symbol. It is found in Hinduism, in Buddhism and Christianity.’ Starting with the basic mandala, the children were taught to draw lotus mandalas, LOA mandalas (ie mandalas reflecting dreams and desires), the archetypal mandala (reflecting how you visualise your family or particular family members) and the ‘you’ mandala (reflecting how you see yourself). The children did the tasks given to them with great enthusiasm and drew the circle shaped mandalas with repetitive drawings within them. 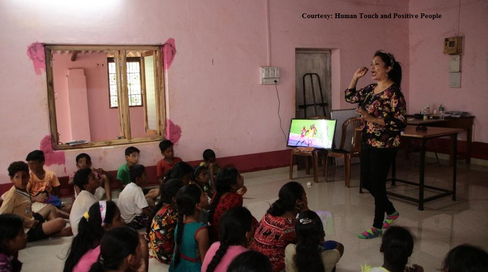 The young people were set physical challenges that could be accomplished by effective communication, and learned to work as a team with the coaching of Vividh Pawaskar, who lectures at Shree Mallikarjun College of Arts & Commerce. ‘Just lecturing is not enough. They need more than words,’ he says, explaining the need for the physical activity which the youngsters were clearly enjoying. The children were engaged in motivation building, conflict resolution and decision-making by Pravin Sabnis and Somu T Rao, and taught first aid by Dr Sneha Naik and Dr Sampada Korde. The older children were given training in being citizen journalists using even a phone camera by Stalin of Video Volunteers. There was a cartoon workshop for the younger children by Fr Lawrence SJ, besides a talk on gender equality by Vasudha Sawaikar. Plenty of competitions, games and sports kept the children occupied for the rest of the time. There was a collage making and a face painting competition, a treasure hunt, etc. In the midst of this fun and frolic, it was evident that the children were the biggest gainers: learning while thoroughly enjoying themselves. These camps for HIV+ children take place only twice in the year (during winter and summer). Yet there is very little done in terms of sponsorship with few generous benefactors. ‘We put our trust in God,’ says Peter, unable to confirm if there will be any more of these camps. Experiencing the rapport between the volunteers and the children, the care and concern shown, as well as the rare moments of pure joy experienced by these children, one concludes that this is something that needs to be maintained. After all, they are members of our society and builders of tomorrow and we are responsible for creating a better tomorrow with these children.